I love Instagram. It’s probably my favourite social network, and one I check far too often. So now everyone has the ability to easily snap, add a filter and upload photos that look like some sort of Rankin-esque in the photography skills category. But, with so many fab shots being shared, it’s nice to make them more than just little images that you scroll past and move on – so I have three little ways here that you can easily bring your instagrams to life and make them more than pictures in an app. 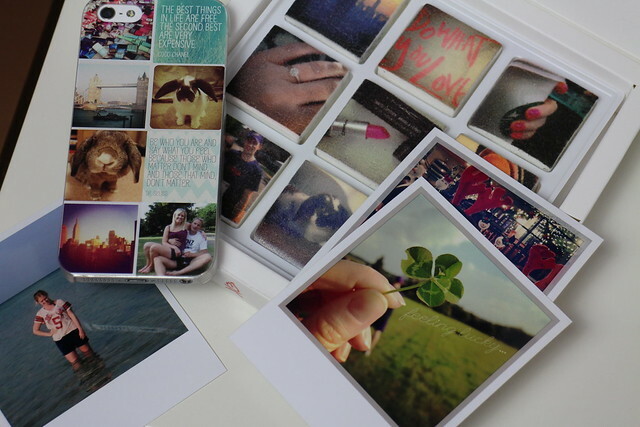 First there’s Casetagram* – where you design your own case to fit your phone, using your instagram and Facebook images. I’ve had this one for quite a while now and I love it – it’s nice to have those little snaps of your favourite faces with you in the day and it always gets comments and compliments from people who spot it. For the more traditional approach you can go for the polaroid print out option from Printic* – where you can print your favourite instagram snaps (and Facebook too) from the comfort of an app on your phone. Each print is just $0.49/0.39 euros or you can buy packs starting from 50 for 19.90 euros. Each print comes in great quality on a little polaroid snap for you to frame or display as you like. I’m personally trying to find ways I might build these into the wedding planning as think using some photos around the decoration might be a nice touch. Lastly, and definitely the tastiest version is the Boomf marshmallows *- with Instagrams printed on them! I discovered these when at the amazing ‘The Apartment’ over Fashion Week and then had the chance to make my own. So I selected 12 shots to get printed – aiming to go for those with the clearest/most striking colour so they came out clearest. This is quite a quirky way to bring your snaps to life – and again, might be an interesting thing to incorporate into a wedding or birthday party as a little personalised sweet treat. Although there’s no denying I do geel a bit bad melting a photo of Chip in a mug of hot chocolate…! Any other ideas on how you like to give your Instagram snaps a bit more life to them?! Great ideas, thanks for posting. I’m definitely going to look into the phone case one, great idea! I love the idea of the phone case, that’s great. I really need to do something with all my Instagram pictures. I really need to print out a few of my Instagram snaps, I would think the phone case is such a good idea to. I did not know that, interesting!